Figure A74. Ryukyu anomaly, interpreted as the Ryukyu slab, with (horizontal) [vertical] cross sections through (A)[D] the UUP07 p-wave) and (B)[D] the combined SL2013 and S40RTS s-wave models at 170 km; C) the location of the modern geological record that we interpret to have formed during the subduction of the slab. The Ryukyu anomaly (Figure A74) is located in eastern Asia below the East China Sea in the upper mantle. 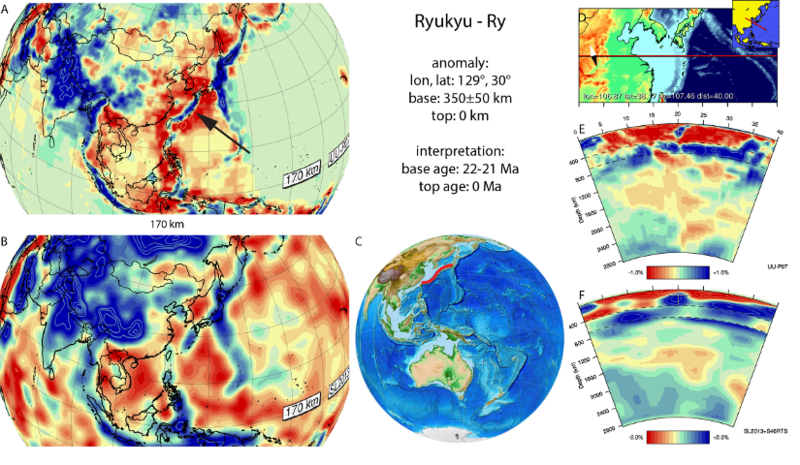 The Ryukyu slab has previously been imaged in numerous regional and global tomographic models (Bijwaard et al. 1998; Lallemand et al., 2001; Zhao and Ohtani, 2009; Zheng et al., 2013; Koulakov et al., 2014; Wu et al., 2016). The slab is connected to the surface at the Ryukyu arc-Okinawa trench subduction zone, and is interpreted as Philippine Sea plate lithosphere that is still subducting northward below the South China block of the Eurasian plate. Towards the northeast it is interacts with the Izu-Bonin and Manchuria (Japan) slabs at a trench-trench-trench triple junction. Towards the southwest, the trench is propagating westwards south of the island of Taiwan, where subduction of the southeastward dipping Manila slab is coming to a halt due to collision of the Philippine Sea plate with the South China block (e.g., Ustaszewski et al., 2012). According to the kinematic restoration of SE Asia of Hall (2002), subduction along the Ryukyu trench started at ~25 Ma, whereas in the reconstruction of Wu et al. 2016, subduction started at ~15 Ma. In the central Ryukyu arc, volcanism started at ~21 Ma (Chung et al., 2000), and we adopt a 25-21 Ma age range for the base of the Ryukyu slab.